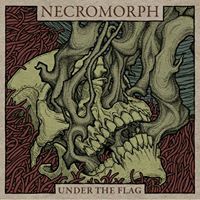 Necromorph are a band from Germany that plays a mixture of death metal, crust, and grindcore and this is a review of their 2016 album „Under The Flag“ which was released by Defying Danger Records. Spoken word samples start off the album before going into a very fast and brutal grindcore direction which also uses a great amount of blast beats while t he vocals bring in a mixture of high pitched screams and death metal growls along with the riffs also bringing in a great amount of melody. Throughout the recording you can hear a great mixture of slow, mid paced and fast parts while the songs also mix in a decent amount of d beat and crust elements along with most of the tracks being very short in length and all of the musical instruments have a very powerful sound to them and when guitar leads are utilized they are also done in a very melodic fashion and stringed instruments are added onto the closing track. Necromorph plays a musical style that takes death metal, crust and grindcore and mixes them together to create a sound of their own, the production sounds very professional while the lyrics are written in a mixture of English and German and cover death, gore and pain themes. In my opinion Necromorph are a very great sounding mixture of death metal, crust and grindcore and if you are a fan of those musical genres, you should check out this band. RECOMMENDED TRACKS INCLUDE „Excrements Of The Sun“ „End In Vomit“ „Handle The Flag“ and „Perfect Day In A Perfect World“. 8 out of 10.